The colors you choose for your brand have a larger impact on the performance of your product than you may think. These colors should also carry over to your website to make your entire brand come together, both online and off. Although you can hire a professional designer if you want to, the only cost you have to put into this choice is the time to really know your product and its customers. While you choosing, it can be easy to go overboard with your colors by choosing too many or using colors that are just too intense or clash with each other. It’s best to be simple as you’re carefully picking colors that will be associated with your brand. Let’s go over a few things you can do to choose the best colors for your company and get the most out of them for your brand. There’s an old adage that less is more. This holds true as you are picking colors for your brand. The whole goal as you pick your brand colors is that you want prospects and customers to subconsciously remember your colors and associate them with your business in a positive way. If you want these customers to remember you, it’s best to not give them too long a list of colors to remember. In order to accomplish this, you should bring down your color choices to two main colors. Start by finding some color inspiration. Don’t just look at lists of colors. Pay attention to all of the colors around you in the world, whether it’s in nature or in man-made items, television, and advertising. It’s likely as you start looking that you'll find certain colors that you gravitate towards. As you keep finding things that draw you to them, look for the similarities in the colors and find what they all have in common. After you have created a color palette of the colors that you are drawn towards, start to narrow that down to just six colors. As you look at these colors, figure out which ones go best together and compliment each other. There may be a couple of colors that are too similar, so go ahead and pull one of those out of your color palette to make your decision easier. You need to ultimately find two colors that are similar in tone: you would want each color in the pair to have a bright, dark, or neutral tone. Try and stay away from pairs that have a dark color paired with a pale color. Finding contrasting colors will come in later when you look for accent colors. Also make sure that the colors fit your business. For example, you might personally be attracted to dark blues and purples, but if your business sells lighting, this is probably not the tone you really want. Or maybe you really love how your logo looks in pink, but most of your audience is masculine. Always keep your audience in mind when making any choices for your business! Once you have found your two main colors and you feel that they not only work well together but also fit with your brand, it’s time to put them to use in all of your marketing materials. This is where you find out how well these colors will actually work together. During this step, you can tweak the colors a little here and there to make sure they work, but in the end, everything needs to have the same colors across the board. Picking colors for your accent takes your palette to a new level. Remember that color palette you made of six colors to pick your two main colors from? Take a look at the colors that are left over and see if one of those could fit in as your accent color. Sometimes this can work, but other times it looks too similar to your main choices. Use your two main colors consistently throughout your branding and your marketing. These are the main colors that customers will associate with your brand and your brand identity. Now you need to find the color that will pop from the rest of your page. This accent color should stand out because it’s brighter, darker, or different in some other way from your main colors. Once you see your main colors consistently on your brand and its marketing, your accent color should come fairly easily. Look for that bright color to jump out at you from among the other two main colors. 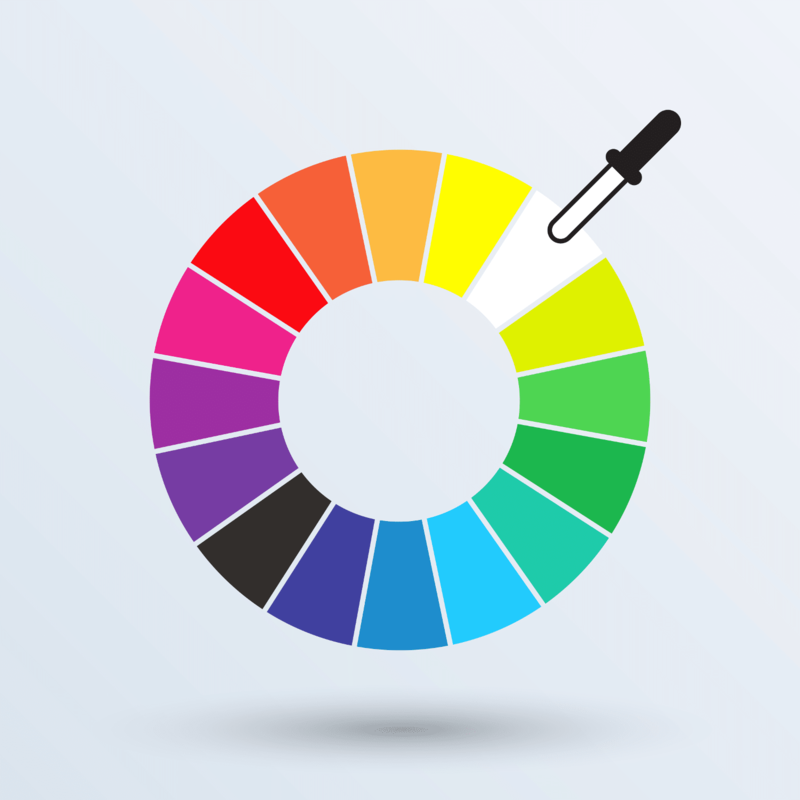 If you are really stumped at this step, it can be very helpful to take a look at color combination guides and color wheels. When picking colors, the important part is to remember to keep your color palette small with just your two main colors and one accent color. Using too many colors can make it look like the colors are competing with each other. You do not want the customer’s attention to focus more on the branding colors than your product. Picking colors for your brand can be a long process to make sure you choose the right ones, but do not get discouraged. Once you find those perfect colors, you will know. Keep in mind through this process that these colors will become your brand identity, so take your time and make sure it's exactly what you want and works for your brand! If you want to further improve your business’s advertising and marketing after choosing your branding, check out Virtual Market Advantage’s blog here!